Praying Indian is a 17th-century term referring to Native Americans of New England, New York, Ontario and Quebec who converted to Christianity. Many groups are referred to by this term, but it is more commonly used for tribes that were organized into villages. These villages were known as praying towns and were established by missionaries such as Puritan leader John Eliot and Jesuit missionaries St. Regis and Kahnawake (formerly known as Caughnawaga) and the missionaries among the Huron in western Ontario. 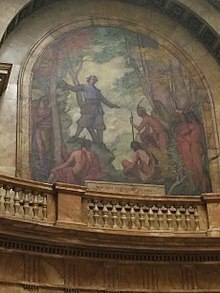 In 1646, the General Court of Massachusetts passed an "Act for the Propagation of the Gospel amongst the Indians". This act and the success of the Reverend John Eliot and other missionaries preaching Christianity to the New England tribes raised interest in England. In 1649 the Long Parliament passed an ordination forming "A Corporation for the Promoting and Propagating the Gospel of Jesus Christ in New England" which raised funds to support the cause. Contributors raised approximately £12,000 pounds sterling to invest in this cause, to be used mainly in the Massachusetts Bay Colony and in New York. Eliot received financial aid from this corporation to start schools for teaching the Native Americans. The Indian nations involved appear to have included the Massachusett and the Nipmuc. On October 28, 1646, in Nonantum (now Newton), Eliot preached his first sermon to Native Americans in their Massachusett language. This happened in the wigwam of Waban, the first convert of his tribe. Waban later offered his son to be taught the English ways and served as an interpreter. Eliot translated the Bible into the Massachusett language and published it in 1663 as Mamusse Wunneetupanatamwe Up-Biblum God. By 1675 20% of New England's Natives lived in Praying Towns. Christian Indian Towns were eventually located throughout Eastern and Central Massachusetts. They included: Littleton (Nashoba), Lowell (Wamesit, initially incorporated as part of Chelmsford), Grafton (Hassanamessit), Marlborough (Okommakamesit), Hopkinton (Makunkokoag), Canton (Punkapoag), Mendon-Uxbridge (Wacentug), and Natick. Today only Natick retains its original name. Praying Indian Towns started by Eliot extended into Connecticut and included Wabaquasset (Senexet, Wabiquisset), six miles west of the Quinebaug River in present-day Woodstock, the largest of the three northeastern Connecticut praying towns. These towns were situated so as to serve as an outlying wall of defense for the colony. That function came to an end in 1675 during King Philip's War. Praying Indians offered their service as scouts to the English in Massachusetts but were rejected. Instead, Praying Indian residents were first confined to their villages (thus restricted from their farms and unable to feed themselves), and many were confined on Deer Island in Boston Harbor. John Eliot tried to prevent it, but it is reported that it became dangerous in Massachusetts to talk in favor of any Native Americans. This likely contributed to the initial successes of the Indian rebellion. The order for removal was passed in October 1675, and by December over 500 Christian Indians were brought to the island. When they were released in 1676, because of the harsh conditions only 167 had survived. After the war, in 1677 the General Court of Massachusetts disbanded 10 of the original 14 towns and placed the rest under English supervision, but some communities were able to survive and retain their religious and education systems. There are several narratives regarding Native American history that are greatly underrepresented. A significant number of Praying Indians fought for the Continental Army during the Revolutionary War. By the time of the war, the vast majority of these Indians had been completely assimilated into their surrounding Christian communities and had fewer significant ties to other Native communities. They fought in entirely integrated units, unlike the African-American soldiers who fought for their country from the Revolutionary period through World War II. There is no evidence of official discrimination for Native American soldiers. They received equal pay and treatment as their white counterparts. That is a direct contrast to unit segregation in the Civil War, for instance. African-American soldiers fought in segregated units, such as the 54th Massachusetts Regiment under Col. Robert Gould Shaw. They were initially paid less than their white counterparts. Soldiers of Native American origin fought in several significant battles during the Revolutionary War such as Bunker Hill, Battle Road, Trenton, and Saratoga. The number of Praying Indian soldiers likely numbered over 100; an entirely accurate count is hard to come by. Unlike other Native groups such as the Iroquois Confederacy, the Praying Indians were cohesive and steadfast in their support for the colonists. The Iroquois Confederacy had several factions, most of which supported the British during the Revolutionary War but some that decided to fight with the colonists. That inevitably led to clashes involving previously-aligned groups, when Native tribes on the opposite sides of the conflict met on the field of battle. For example, the Battle of Oriskany on August 6, 1777 saw Loyalist Seneca soldiers fighting against colonially-aligned Oneidas. The Praying Indians never saw such a split. They had extremely close ties to both the Puritan clergy that established the Praying towns, as well as non-Native peoples that lived among them. Despite continued seizure of Native lands, the various Praying Indian communities realized that their continued survival could only be ensured by close ties to their communities; support of a distant government would only serve to alienate themselves from those who were in close proximity. In particular, Praying Indians from Natick and Ponkapoag (present day Canton) served in large numbers. The borders of Revolutionary-era Natick have since changed and included what is now Needham, Dedham, parts of Framingham, Dover, Wellesley, and other Metrowest communities. The first significant engagements Praying Indians participated in were the Battles of Battle Road and Bunker Hill. Approximately five out of the estimated 21 Native Americans at Battle Road were from Praying Indian communities, and out of the estimated 103 Native Americans at Bunker Hill about 10 were Praying Indians from the Natick area (primary source confirmation of service histories puts these numbers significantly less). As a result of the unit integration in the Continental Army, in most cases there was no real concentration of Praying Indians in a single unit; Praying Indians served in dozens of distinct units throughout the Revolutionary War. The Battle of King’s Bridge in the Bronx, where both Daniel Nimham, the last sachem of the Wappinger and his son Abraham were killed along side some 60 members of the Stockbridge Militia is a notable exception. James Anthony was born in Natick and initially served for eight months in 1775 in the regiment of Col. Jonathan Ward and in the company of Capt. James Mellen. He later re-enlisted for three years from 1777 to 1780 in the 4th Massachusetts Regiment under Col. William Shepherd, serving in Capt. Reuben Slayton’s company. The unit fought at Saratoga and was present at Valley Forge during the winter of 1777. Anthony was discharged 14 March 1780. Caesar Ferrit from Natick came from a diverse background: West Indies, French, Dutch, and Natick Indian. Born around 1720, he was raised in Boston by an English family and studied animal husbandry. He lived in Boston for several years but then moved to live among the Natick Indian community in 1751; this may have been the group he identified strongest with. He answered the call for Minutemen at Lexington and Concord with his son John and was part of a group of militia under Capt. Joseph Morse that ambushed British soldiers in Lexington. This engagement was likely one of the first skirmishes of the battle and the entire Revolutionary War. He enlisted in various militias and regiments throughout the war, serving in Massachusetts, Rhode Island, and New York under numerous commanding officers. He was discharged from service in 1781 at the approximate age of 61. He died in Natick in 1799 at the approximate age of 79. John Ferrit was the son of Caesar Ferrit and followed his father to the Battle of Lexington and Concord. He was part of the company under Capt. Morse that was likely one of the first groups to directly engage the British at Lexington. Like his father, he served in various units throughout the war and fought in New York and Rhode Island. He was discharged in 1781. Thomas Ferrit had a much shorter military stint than his brother or father. Born in 1751, he served for two days as a Minuteman at Lexington under the command of Capt. Ebenezer Battle. After the skirmish there is no record of military service, but he was married in Natick in 1777. Joseph Paugenit Jr. was born in Framingham and was baptized in Natick in 1754. His father, Joseph Sr., fought during the French and Indian War. He served in the company of Capt. Thomas Drury under the command of Col. John Nixon, and fought at Bunker Hill. He later re-enlisted in the Col. Thomas Nixon’s 4th Regiment in New York and fought at the Battles of Harlem Heights and White Plains. After his second discharge he re-enlisted a second time, once again under Col. Thomas Nixon. He fought at the Battle of Saratoga and was reported as deceased soon after, likely as the result of wounds sustained during the battle or from contracting smallpox. Alexander Quapish was born circa 1741 and enlisted in Dedham in 1775. He served as a member of Lt. Col. Loammi Baldwin’s main guard in the regiment of Col. John Brewer. He took ill in March 1776 and died in Needham. Records indicate Michael Bacon, who cared for him in his last days, conducted his burial and sought compensation from the Continental Army for his services. Samuel Comecho served in the Battle of Bunker Hill under the command of Capt. Benjamin Bullard in Col. Jonathan Brewer's regiment. Born in Natick, Comecho enlisted for eight month's service and his unit held the line at Bunker Hill between the redoubt and the rail fence. He re-enlisted on the first day of 1776 in Col. Asa Whitcomb's regiment and served in Capt. William Hudson Ballard's company in the Canadian theater. It was reported that he died on March 14, 1776. The cause of death was likely smallpox. The sacrifices made by Praying Indians and other minority groups during the Revolutionary War have never been properly celebrated. It was not until the 20th century that these veterans were first recognized. The town of Natick installed a monument to Native American veterans of the Revolutionary War in 1900, which still stands today on Pond Street near Natick Center. However, it was not until Needham historian Robert D. Hall Jr. that their final resting places were properly honored. Hall and volunteers placed grave markers and American flags in a Needham cemetery to honor these veterans in 2003. The Praying Indian communities were able to exercise self-government and to elect their own rulers (sachems) and officials, to some extent exhibiting continuity with the pre-contact social system, and used their own language as the language of administration, of which a wealth of legal and administrative documents survive. However, their self-government was gradually curtailed in the 18th and 19th centuries, and their languages also became extinct around the same time. During that period, most of the original "Praying Towns" eventually declined due to epidemics and to the fact that the communal land property of others passed out of native control. The Indian-inhabited areas were eventually transformed into "Indian districts". A wedding ceremony of modern-day Natick (Massachusett) Praying Indians. Descendants of the Praying Indians from Natick have organized as the Praying Indian Tribe of Natick, currently under the leadership of Rosita Andrews or Caring Hands from Stoughton, Massachusetts, who received her title of chief from her mother. The Praying Indian members live within a radius of 20 miles (32 km) around Stoughton. According to Caring Hands, in 2011 there were just under 50 members of Natick Praying Indians. On 11 August 2012, members of the tribe celebrated a public service in Eliot Church, South Natick, the site of the original church of the Praying Indian town of Natick, for the first time after almost 300 years. Several books and journal articles have been written about this topic. One of the most extensive overviews of Praying Indians in the Revolutionary War, which includes service and life histories, is George C. Quintal's Patriots of Color - 'A Peculiar Beauty and Merit'. Additionally, Daniel J. Tortora, Associate Professor of History at Colby College in Waterville, ME, wrote an article titled, "Indian Patriots from Eastern Massachusetts: Six Perspectives" in the Journal of the American Revolution. This work details six different Indians of Eastern Massachusetts origin that fought in the Revolutionary War, including several with Praying Indian roots. Jean M. O'Brien's Disposession by Degrees: Indian Land and Identity in Natick, Massachusetts 1650-1790 and Daniel R. Mandell's Behind the Frontier: Indians in Eighteenth-Century Eastern Massachusetts are both extensive volumes that delve into Native American life in Massachusetts. For historical context, Kathryn N. Gray's John Eliot and the praying Indians of Massachusetts Bay: communities and connections in Puritan New England is an excellent overview. Forgotten patriots: African American and American Indian patriots in the Revolutionary War: a guide to service, sources, and studies by Eric G. Grundset provides a comprehensive overview of historical methodologies used when studying this and similar topics. ^ a b Adams, James Truslow (1921). The Founding of New England. Boston: The Atlantic Monthly Press. p. 357. ^ Biglow, William (1830). History of the Town of Natick from 1650 to 1830. Boston. p. 25. ^ Goddard, Ives and Kathleen J. Bragdon (eds.) (1989) Native Writings in Massachusett. Philadelphia: American Philosophical Society. P. 14. ^ a b c Hall, Robert D. Jr. (2004 - 02 - 08), "Praying Indians in the American Revolution" Needham Historical Society. ^ Raphael, Ray (2002). A People's History of the American Revolution. Harper Perennial. p. 252. ISBN 0060004401. ^ a b Schmidt, Ethan (2014). Native Americans in the American Revolution: How the War Divided, Devastated, and Transformed the Early American Indian World. Praeger. p. 52. ISBN 0313359318. ^ Mandell, Daniel R. (2000). Behind the Frontier: Indians in Eighteenth-Century Eastern Massachusetts. University of Nebraska Press. ISBN 0803282494. ^ O'Brien, Jean M. (2003). Disposession by Degrees: Indian Land and Identity in Natick, Massachusetts 1650-1790. University of Nebraska Press. ISBN 0803286198. ^ Biglow, William (1830). History of the Town of Natick. Boston: Marsh, Capen & Lyon. p. 44. ^ Goddard, Ives and Kathleen J. Bragdon (eds.) (1989) Native Writings in Massachusett. Philadelphia: American Philosophical Society. P.2-15. ^ "Praying Indians of Natick and Ponkapoag (official web site)". Retrieved 2013-11-06. ^ Allan Jung (2007-02-07). "Family a chief concern for Praying Indians leader - Caring Hands, chief of the Praying Indians". Metrowest Daily News. Retrieved 2013-11-06. ^ Bob Reinert (2011-11-17). "Natick observes American Indian Heritage Month". USAG-Natick Public Affairs. Retrieved 2013-11-06. ^ "Native American tribe worships in first public service in 300 years". Anna-Claire Bevan. 2012-08-16. Retrieved 2013-11-06.